Alden Leifer, MD and Associates is fortunate to have a great optical shop right in our office. Eye to Eye Optical and our wonderful licensed optician, Marjorie Leon, better known as Rosie, services all our patients’ eyewear needs. 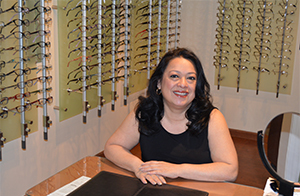 Rosie has over 20 years experience as a Certified, Licensed Optician and has a great sense of style that helps her find the best looking frame for every person. 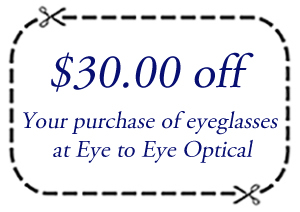 Eye to Eye has a wide variety of fashionable frames and designer collections for all budgets. Rosie has expertise in all specialty lens materials including polycarbonate, polarized sunglasses, Transitions®, progressives and anti-reflective coatings. Individual lifestyle and prescription is always taken into account when recommending lens options. Eye to Eye Optical focuses on excellent customer service and makes use of only the highest quality frames, lenses and optical lab. Attending continuing education courses on a regular basis ensures that every patient is delivered the most up to date technology to fit them with eyeglasses that best meets their needs. When you need a change in your glasses or are just looking for a “new look”, feel confident that you are in the right place to handle all your needs. Even if you do not need new glasses please be sure to stop by and see Rosie when you are in the office for a free cleaning and eyeglass adjustment. Transitions is a registered trademark of Transitions Optical, Inc., used under license by Transitions Optical Limited.